Map It! Okinawa: "The Kushi Kannon-do Temple"
In a small town in Nago City on the eastern side of Okinawa lies a very small Buddhist temple called the Kushi Kannon-do. Inside the temple is a statue of a Bodhisattva carved out of stone. It is a statue of Kannon-sama, often known as the 'Goddess of Mercy'. In Chinese, she is referred to as Guanyin. Though perhaps mostly viewed as female, the Bodhisattva is sometimes depicted as taking a male form. 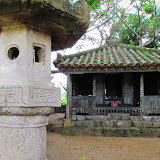 Villagers from the Kushi area would sometimes call this statue, 'tira nu tame', which translates to as 'the old man who lives in the temple' in local Okinawan dialect(1). It is believed that around 1688 was when this temple was first constructed and then later renovated in 1973. 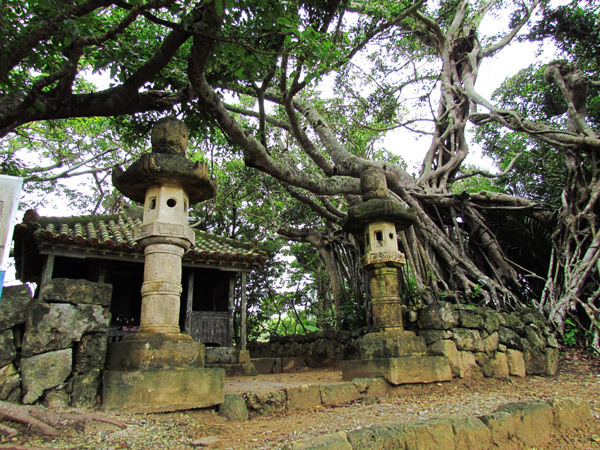 The temple is mostly made of 'Chagi' wood (Okinawan Hogen name) or 'Inumaki' in Japanese (Podocarpus macrophyllus). 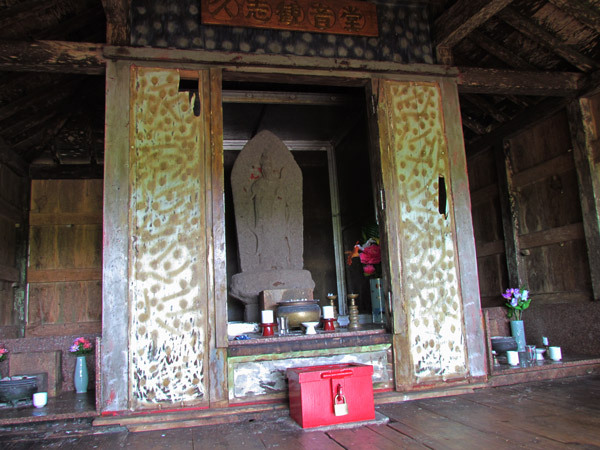 It is local custom that nearby villagers come here 4 times every month to pray and worship. January 18th, September 18th, and December 24th of the Lunar Calender are major religious days of observation where villagers come here to pray for the town's prosperity. They also come here to pray for personal needs such as for a safe voyage or for a healthy birth of a child. If someone died from the village they would also come here to pray that their soul enters heaven without any regret or remorse. Mysterious Origins. There is some confusion about the temple's origin. The explanation sign near the temple only goes as far as to say that a lord from the Tomigusuku region had given this stone statue to a man in Kushi, but never gave any explanation on why. However, in a old book written in 1969 by James C. Robinson, called 'Okinawa: A People and Their Gods', an aji (meaning lord) from the Kushi region was visiting China when he had become seriously ill. The aji prayed to this particular statue of Buddha and subsequently became well. He had brought back the statue to Kushi and erected this small temple in its honor. If indeed, the latter story is true, then it goes to show the extensive communication channels that had existed previously with China from even the most remote areas of Okinawa. Other areas near the temple. 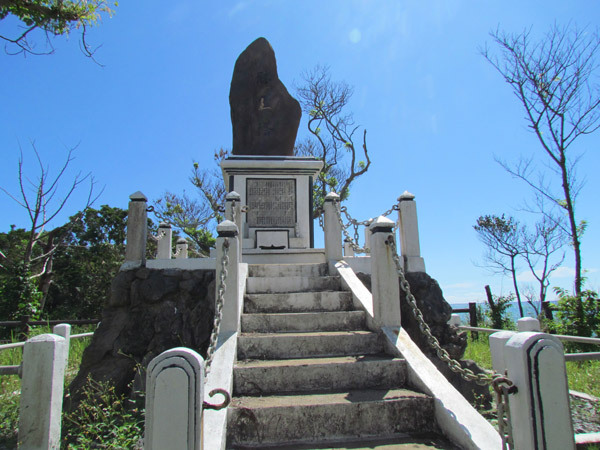 Close to the temple you will find a Kushi War Memorial that overlooks the ocean and a memorial giving tribute to citizens of Kushi (history not certain at this time). Recommendations. Villagers still come here to pray. If you do happen to arrive during a prayer session, just keep a respectable distance till the prayer session is done. There are some interesting things to see in this small corner of town to keep you plenty occupied while you wait. Source of Information. 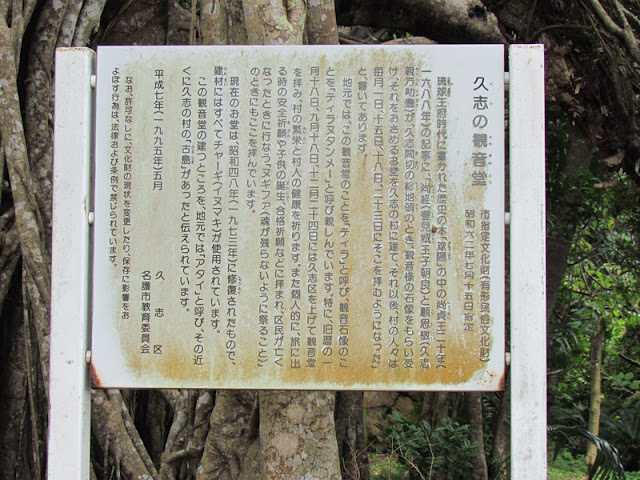 Explanation sign on site (in Japanese), Book: Okinawa: A People and Their Gods, James C. Robinson, 1969, pg 59. 1. 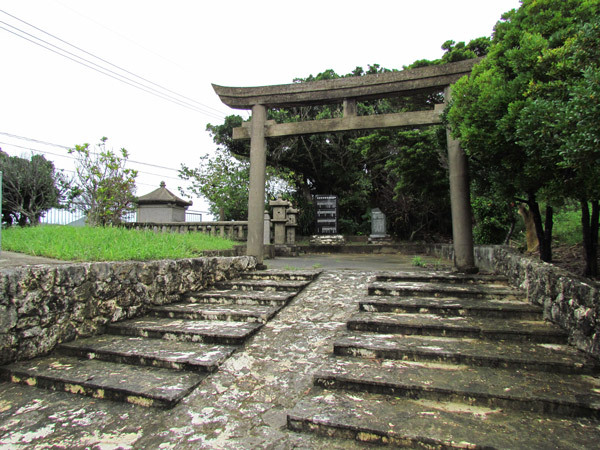 The word 'tira' (ティラ) means 'temple' in the Okinawan language. It is important to note that the sound 'ti' does not exist in standard Japanese pronunciation. This is only used in the old Okinawan dialect. Directions/Parking. Take Highway 329 (in Nago) and turn on Highway 13 (see blue route on the map). 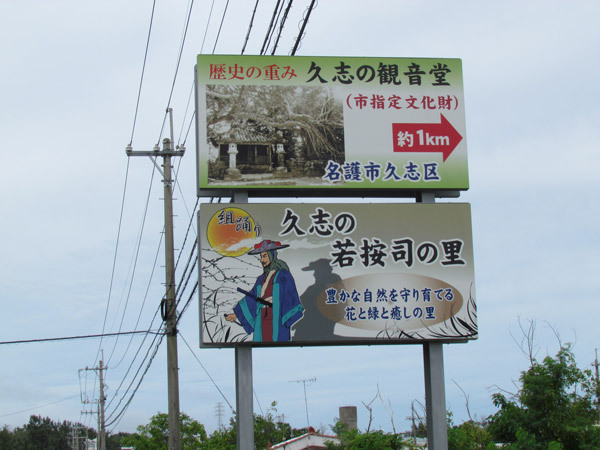 The turn-off for Highway 13 will have this billboard directing you to the Kannon-do Temple. The temple will be very close to these Landmarks near the road: the Kushi War Memorial and the Torii Gate (memorial shrine) opposite of the Kushi War Memorial. There is a parking area near the temple.